Tragedy brings heartache to the community of Apple Blossom when a car takes the life of Mary Noel Simmons's best friend—her dog. The loss nearly destroys Mary Noel's spirit. As the injured six year old lies in the hospital, traumatized and silent, the medical bills are piling up quickly with no way for her parents to pay them. Filled with kindness and romance, this story of hope and faith will warm your heart. June, is your book based on real events? Without spoiling the plot of A Holiday Miracle in Apple Blossom, the Christmas Eve church scenes come directly from my special memories of the candlelight service at my childhood church. Also, the trauma sustained by little Mary Noel really happened on my street to a younger sister of my playmate when she was around four years old (I was around eight). The main character of the book, Amber Kellen, is a brand new first grade teacher, and some of her classroom experiences are the same as mine when I was starting out as a first grade teacher. Not to have regrets in life. Do the best you can, and then let it go. You can't fix everything that's wrong with world, but you can make a positive contribution in your small corner of the world whenever possible. Being in congested traffic where other people are cutting me off, making dangerous lane mergers, and/or following my car too closely, etc. All of that stress is compounded if I see someone talking or texting on their cell phone when they are supposed to be driving. Yikes! Spending time visiting historic homes, museums, gardens, and parks. Viewing other creative people's quilts, sewing projects, and art at galleries, quilt shows, and the California State Fair. Working with my quilting group to make 'comfort quilts' for individuals who are ill, traumatized, or grieving. A good writing session where the words and dialog really flow. Reading a really touching book where I can relate to the characters and/or their situation. I was blessed to have a twenty-year career as a primary teacher. I wanted to be a teacher from the time I was about four years old. Contributing to the lives of children in a positive way was a very satisfying and worthwhile career for me. I still enjoy reading children's books from picture books to middle grade fiction. Walking in a botanical garden, park, forest or near the ocean with my best friend. Author Debbie Macomber, Author Lisa Scottoline, Author Lauren Wolk, Author Laura Ingalls Wilder, and Quilt Designer and Author Blair Stocker. They all represent different genres, and I feel they would open new doors of great literature and non-fiction books to me. How much space do you have? I have so many genres I love to read. I have been a voracious reader since I was a young child, so I have a lot of favorite authors. Here's a short list: Lisa Scottoline, Debbie Macomber, Lauren Wolk, Laura Ingalls Wilder, Louisa May Alcott, Amy Tan, John Grisham, Beatrix Potter, Sue Grafton, Shelley Sheppard Gray, Jan Brett, Ree Drummond (cookbooks), Emma Hardy, Blair Stocker, Jennifer Beckstrand, Dr. Suess (for the rhyme and artwork), and oh, so many more. Do you have any reading quirks? I'm not sure it's a pet peeve, but I like to end my reading sessions at the end of a chapter. Oh, and I always read the Acknowledgments page and author bio at the end of the book before I start reading the text. I find I am at my most creative in the mornings. I get out my story map, research notes, and character descriptions (all written on paper) and lay them on the table next to me. Nearby I have my dictionary, thesaurus, and Bible for quick reference. I open my Word doc and scroll down to where I stopped the previous writing session, pause to gather my thoughts, and begin typing new material. Sometimes my goal for the day is to edit what I wrote in my previous session. I think a reader enjoying the story is the best compliment I could receive about my work. Several of my friends and many reviewers told me they loved how the Apple Blossom community came together to help a family in need. They said the story (and the book's cover art) reminded them of a Hallmark movie. Having watched some of those movies myself, I was honored to have my novella compared to Hallmark's high standards for their screenplays. Another author posted that she loved the story because it made her think of others at a time of year when most people are focused on their own Christmas 'to do' lists, buying gifts and creating the perfect holiday experience for their families. Anytime someone contacts me on by email or on my Author's Facebook page to tell me how much they enjoyed the book or how it touched them deeply, I feel grateful that I had the opportunity to share the story with readers. How did you find your publisher and how long did your query process take? 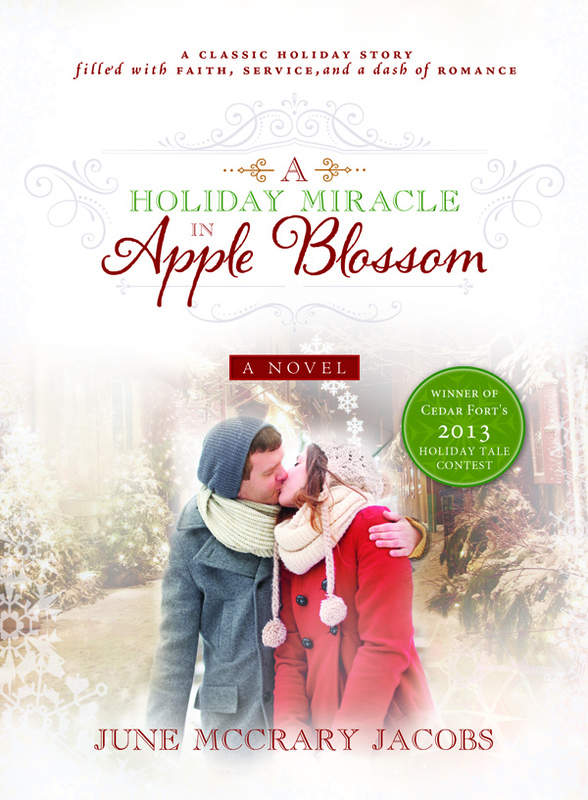 A Holiday Miracle in Apple Blossom was published by Cedar Fort Inc. as the result of my winning their 2013 Holiday Tale Contest. I found the Call for Submissions for the contest online in November, 2012. The submission was due in the third week of January, 2013. When I read about the contest, I immediately thought, 'I can do this!' I had already thought of the main characters and the basic premise of the plot because I have an overly active imagination and I am fortunate to be a creative thinker. I was ecstatic when I found out in February, 2013, that I was the winner. One of the prizes was the publication of this hardcover gift book. I am working on finishing and polishing Book Two in my Bonita Creek Trilogy. It is the continuation of Robin's Reward, and is the story of Robin's cousin, Penny Ralston, and her search for love and happiness amidst many challenges in her life—past and present. This contemporary inspirational romance series is set in the majestic coastal mountains of the Northern Coast of California in a small, tight-knit community I named Bonita Creek. 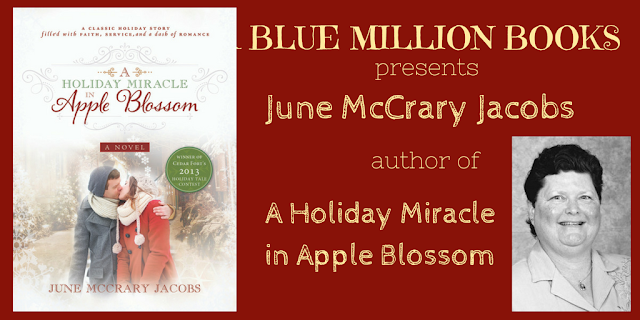 Read an excerpt from A Holiday Miracle in Apple Blossom. Award-winning author, June McCrary Jacobs, was the winner of Cedar Fort Publishing’s 2013 Holiday Tale Contest for her debut novella, A Holiday Miracle in Apple Blossom. Robin’s Reward, released in April, 2015, was her first full-length novel. This inspirational contemporary romance is the first installment of the ‘Bonita Creek Trilogy’. The series is set in June's favorite location in California—the Mendocino coastal region. June’s original sewing, quilting, and stitchery designs have been published in over one hundred books, magazines, and sewing industry blogs in the past few years. 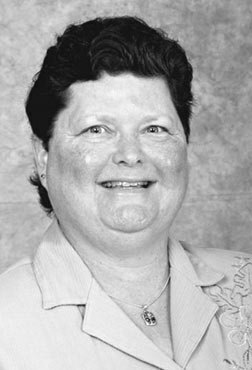 She wrote a recurring column for a sewing magazine published in Great Britain and contributed several other articles to sewing and craft magazines published in the United States. When she’s not writing, reading, or sewing, June enjoys cooking, walking, photography, and visiting art and history museums, parks, and botanical gardens. She also enjoys touring historic homes (especially when they're decorated for Christmas!) and strolling around the many historic Gold Rush towns in the Sierra Nevada foothills. In the summertime you can find June at a variety of county fairs and the California State Fair admiring the sewing projects, quilts, and handiwork other inspired seamstresses, quilters, craftspeople, and artists have created. **Note: The ebook for A Holiday Miracle in Apple Blossom is on sale for half-price at $2.99 on Amazon, Barnes & Noble, and Books & Things through December 20th, 2017. Cedar Fort Inc. will be giving away ten hardcover gift book copies of A Holiday Miracle in Apple Blossom on Goodreads. The contest runs through December 1st, 2017, and is open to US residents only.